Just because beating the Elite Four and becoming the Champion of Kanto is the original goal, it’s not the only thing you can set out to do when it comes to Pokémon: Let’s Go, Pikachu! and Pokémon: Let’s Go, Eevee!. On top of completing your Pokédex, you can also take up Shiny Hunting or take on the Master Trainers. Only, because not every Master Trainer requires you to fight them, you might be a little hard pressed when it comes to earning the likes of the Meltan Master title. 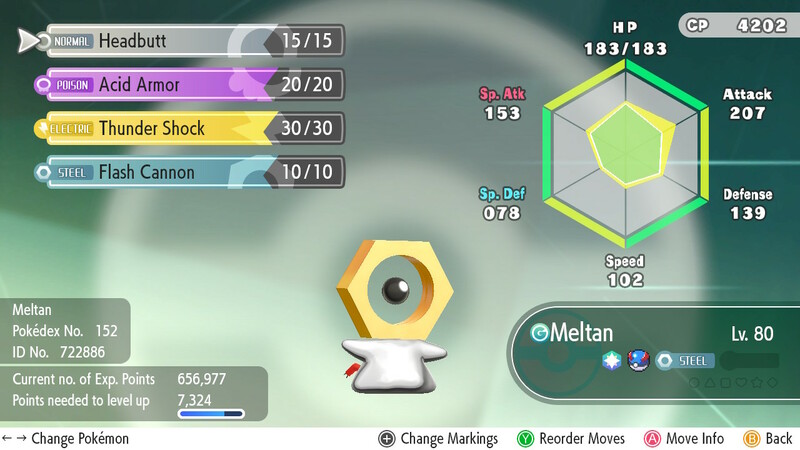 The reason for this, is because the likes of the Meltan Master wishes to lay eyes upon a powerful Meltan but just what counts as powerful? Is it Meltan’s level? Meltan’s CP or something else? Well, that’s precisely what we’re going to cover in this guide! First things first, in order to even attempt to earn the Meltan Master title, you will need a Meltan and you’ll also need to have beaten the Elite Four to unlock the Master Trainers. You will also want to have learned the Secret Technique “Sky Dash,” as that will enable you to fast travel to Cinnabar Island. Still, before you go dashing off anywhere, you will need to take the time to strengthen your Meltan. The actual level does not matter as it is the CP that counts, so even if you don’t level up your Meltan per se, as long as you feed the Pokémon a lot of Candy, then that will do just fine. Tags: Guide, Meltan, Meltan Master, Nintendo Switch, Pokémon Let's Go!, Pokemon: Let's Go Eevee!, Pokemon: Let's Go Pikachu!